The Lamb's War: Who is a Quaker? 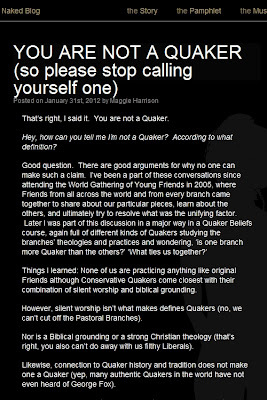 This week, my friend Maggie Harrison published a bold post entitled "YOU ARE NOT A QUAKER (so please stop calling yourself one)," in which she challenges us to examine the basis of our faith. With breath-taking hyperbole, Maggie declares that we need to get serious about the process of spiritual transformation - or get out. She writes, "Stop diluting our movement and muddying the waters with your wishy-washy comfort-driven engagement with this group that you think is cool or enjoy 'meditating' with. ... PLEASE LEAVE." As one would expect, this blog post by a twenty-something Quaker minister telling us all to get the hell out of her denomination went viral. In the comments section, Maggie has been getting alternating hot/cold showers of praise and indignation from Friends across the world. Some Quakers are excited that she is preaching a more serious faith, one that goes beyond rote tradition and feel-good religion, instead embracing the call to radical transformation by the Refining Fire, the Search Light - Christ in us, the hope of glory. Many others had a viscerally negative reaction to Maggie's post. Clearly, hyperbole does not translate well over the internet, and many individuals seemed to feel personally threatened, believing that Maggie was seriously calling for them to be thrown out of their Meetings. They accused Maggie of being "holier-than-thou," and of totally violating the norms of Liberal Quakerism by judging the spiritual condition of her fellows. To be frank, this blog post really pissed some folks off. In a way, this is too bad. I know that Maggie was just being silly. Maggie loaded up her rhetorical shotgun and hit us with both barrels. She was looking to get a reaction out of us, and by God (yes!) she did. God made Maggie silly for a purpose, and God is using her to wake us up. Because while her delivery is extreme, profane and off-putting, her message is holiness itself. I give glory to God for the witness that the Spirit has raised up in Maggie. I am thankful for her faithfulness in walking the path of spiritual purification and growth in the Lord. Maggie's essay cries out for a sanctification of Quakerism, calling the Religious Society of Friends back to its roots in spiritual transformation by Christ's light. The Quaker church began as a radical movement of prophetic faithfulness to God's living Word (the Risen Lord Jesus), and was far more concerned with embodying and proclaiming that message than it was with buildings and endowments; history and Nobel prizes. 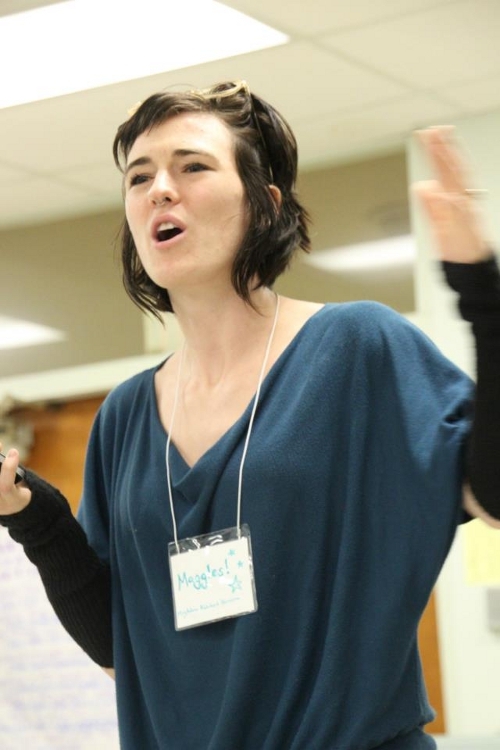 Maggie wants to see Quakerism live up to its full potential, to be holy. I feel exactly the same way. We are called to so much more than secure lives in the lap of Empire. We are called to be more than nice, good people. We are called to be holy. The Seed of God is oppressed by the weight of our lives, the way that we have allowed a myriad of other concerns to take precedence over basic faithfulness. We shame the name "Quaker." We have nothing to do with it. While some are astonished at Maggie's boldness, I think that she has not gone far enough. You are not a Quaker. Neither is Maggie. Nor am I. We are nothing like Quakers. We are pale shadows of those charismatic extremists of the early Quaker movement, who shook the earth for ten miles around when they preached. It is a mockery for us to claim to be one of them. We have been coasting on the accomplishment of real Quakers for far too long. We love to brag about Quakers' involvement in the Underground Railroad and the abolition of slavery. We adore letting people know about the good works of Friends in reforming the prison system, intervening in war-torn countries, and supporting the Civil Rights movement. We are so proud of "our" Nobel peace prize. But we are frauds. Quakers do not exist anymore. Three hundred and fifty years was a good run, but it is over now; and the longer we pretend to be something we are not, the more we disgrace a once-proud people. What if we were to confess that none of us are really Quakers anymore? What would happen if we had the courage to stop laying claim to the past glories of George Fox, Margaret Fell, William Penn and Bayard Rustin? What if, instead of basking in the fiction of our status as "Quakers," we humbled ourselves and started putting our energy into actually nurturing the communities that depend on us? Because, while Quakerism does not exist anymore, our Meetings do. Our local churches, fellowships and Yearly Meetings are more real than any imagined "Quakerism" could ever be. Are we being faithful in caring for our brothers and sisters, humbling ourselves in service to others? Are we courageous in standing up for truth and mercy, and inviting our local congregations to join us in serving the "least of these" in our society? Do we have the patience to wait on God, allowing Christ's living presence to transform us and remake us from the inside out - not just as individuals, but as whole communities? What if we stopped trying to be Quakers? What if, instead, we put our energy into being communities that truly reflect the love, joy and peace of the God of Abraham, Isaac and Jacob? What if, instead of trying to preserve an heirloom faith, we cast aside everything except our determination to be God's holy, chosen and beloved people, here and now? My Ffriend Rodger says we should lay the RSF down every 50 years, when the fire has died down and everyone starts thinking more about the organization and status than about the Fire. Then wait until someone catches Fire again - and let them start a new movement. I agree. Three times I have thought of formalizing my relationship with a meeting. Three times Quakers drove me away. I hear this from other seekers, as well. So, despite history and all those horrid things my church did to Quakers back when church and government were one, I remain an Anglican. I almost made the leap a couple of weeks ago, and was bitterly attacked for my spirituality by a Quaker. that is a no-go zone, sorry. When people ask me "are you a Quaker?" - Friends as well as friends - I always hesitate, and say "for conversational purposes, yes" but go on to clarify that claiming an identity is divisive, and division is often at the root of violence. But I do say that the ideals of Quakerism are what I aspire for and most speak to what I truly believe - that there inherently is that of God in all things - and my life commitment is to let that flow. Having said that, I am not sure that enflaming people with proclamations that people are not Quaker moves us forward either. Regarding Maggie's writing about "being naked", I think we also need to constantly strive to cleanse our hearts and minds of pre-judgments and negative emotions that thwart our ability to be fully loving and present with all people, speaking our truth not as a "greater than your truth" but as part of an exchange of truths that move us towards a bigger Truth, and we need to do this not in a closed circle, but really out in the world. It is not enough to sit among Friends, decide what it Truth, and then go out proclaiming it. It is practicing it - really living that "there is that of God in all". 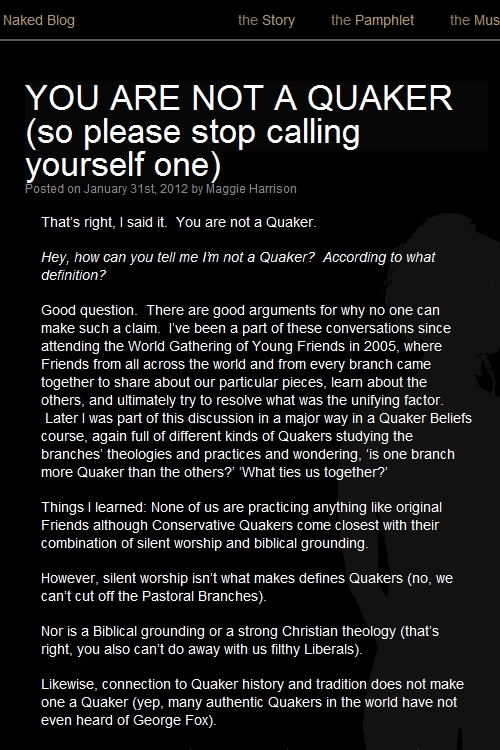 I agree with Maggie’s assertions that silent worship, Biblical grounding, strong Christian theology, and connection to Quaker history and tradition are not what make one a “Quaker”. That is a minor quibble, really; there is nothing wrong with starting with the fire, so long as you are willing to go on and learn more. The bigger problem is that, even in regard to the fire, I think Maggie gets it wrong. Fox's passionate focus wasn’t on “stripping away all that is not righteous”. Some mediaeval monks had that focus, but Fox was not such a monk. He felt, obeyed, and preached a call to perfection, but that perfection was a matter of faithful obedience — following the Teacher at every turning point — rather than a matter of judgeable personal traits or outward results. The difference is important, because an emphasis on becoming nothing but righteous is a works theology. An emphasis on simply listening in this moment — and then in this moment, and then in this one — is a faithfulness theology. A faithfulness theology is vastly more conducive to humility. More broadly: when the leading early Quaker ministers preached to new hearers, none of them built their sermons around ideas of stripping oneself bare and then clothing oneself in righteousness. Their sermons revolved around a simpler message: just listening to the voice in the heart and conscience that reproves us when we do wrong, and that draws us to do things that are good and kind even if it costs us our lives — and then, obeying that voice. We have both their own writings, and the testimony of outsiders, to show this was so. In the eighteenth century, when Friends were no longer preaching so much to outsiders as to their own, we find the same theme present in the labors of Friends like Joseph Pike and John Woolman, as they visited backsliders and pulled them back onto the path. One doesn’t find ambition in Fox, for all his fire, except when he became jealous of Nayler and Perrot. And those were his unlovely moments. One does find ambition in Nayler’s ride into Bristol. But one does not find it afterward. in Nayler’s dying words about the “Spirit that I feel....” At that end point, he had been cleansed of the error of ambition. I agree with Maggie that the return to Gospel order (or whatever we want to call it), is almost as central as hearing and obeying that voice. It’s sort of an epicenter, like the spot on the Earth’s surface some miles directly above where an earthquake actually happens. Maggie is very right, I think, to bring this matter up. But Gospel order, like righteousness, is an epicenter, not the center. It’s not the fountain of the Spirit. It’s a product of obedience, not a starting point for reform. If we take it as a starting point, it becomes notional, a political agenda, and agendas, like ambitions, tend to turn to our own hurt. "And Jesus answered them, 'The hour has come for the son of man to be glorified. Truly, truly, I say to you, unless a grain of wheat falls into the earth and dies, it remains alone; but if it dies, it bears much fruit. He who loves his life loses it, and he who hates his life in this world will keep it for eternal life." I had two reactions, first upon reading Maggie's comments a few days ago, and now upon reading yours. Second: Where is it written that the Spirit will always call us to the kind of fire that can be seen among some of the early Friends? It was not seen among all early Friends, and yet they were the backbone of the movement. It takes as much Light to see the strengths of the RSF as it is, as it does to see a vision of how much more it could be. Truly the spirit is moving in similar ways throughout our liberal branch of the religious society of friends. We will find a way to be quakers yet! Thank you, Micah. What thee (& Maggie) has (have) said is good. Much love. I believe there is a movement of the spirit throughout all the christian denominations calling Christ's followers to greater holiness. I have no quarrel with the message. When the Spirit lights a fire in one's belly one sometimes forgets to speak in love. I now rarely worship with my local Meeting because it is liberal [very] & I am uncomfortable with the lack of gospel truth. Amen--let it be so. Thank you, Micah! How could thee (or I) "become a community"? If I start attending-to/following God moment to moment... that isn't something I can do alone, or without affecting other people around me. See, each Meetings already works as a sort of 'group spirit'; and this has largely been holding us all back together. But if one member suddenly starts getting it, this probably won't happen to that person in isolation; we'll find ourselves waking up together. As may well be happening, and isn't it about time?! But for each person, it's his own effort/gift. My family come to this country as Quakers/Friends. I was raised without religion untill my 13th birthday when my fodter parents introduced me to protestant religion. I re discovered Friends at age 40. What I see of Quakers/Friends today is not what I understand of them (I am not an official Friend). What I understand of Quakers/Friends or at least how they started out can best be found by watching Angel & the bad man with John Wayne. If ever I find those kind of Friends again; I will with my family once more be a Friend. This is important. My thanks and gratitude to all who are participating in this discussion and for the continuing commitment to prayer, study, and reflection. It has been a long time since these questions have been asked and they need to be dealt with. My abiding concern is that we are given what we need and that right now we are being given much, which means that we have challenges ahead. When I read Maggie's original post, it definitely seemed that she was writing "tongue in cheek", but all the earlier comments seemed to take it at face value, and I assumed I had misread. I'm glad to hear that my first impression was the right one, and appreciate Micah's correcting my second, less favorable, impression. On another note, I'm struck by the implicit assumption in many "who's a Quaker" threads that the first Quakers were necessarily the most authentic article, and therefore an appropriate measure of Quakerness. It's an idea that seems to appear across many religions traditions, and maybe it's true. Then again, maybe it's not. I wanted to continue my earlier thought, which felt unfinished. Was the proportion of Quakers who played an active role in Abolition, or on the Underground Railroad, so much greater than those giving true service today? Did so many more labor in post-WWII Germany? It's true that I haven't met any Friends who shake ten miles of land when they preach. Then again, did a county full of English farms really shake when George Fox spoke? And is the loudest, or best known, or most celebrated preacher necessarily the closest to the Light? That certainly hasn't been my experience, and it seems a less than obvious assumption for those who know the value of silence. I have real admiration for William Penn, but I know a number of living men and women who I believe would act with equal integrity, did some present-day Charles II award them 29 million acres of (somebody else's) land. I agree wholeheartedly with Micah that it is better to give true service than to pursue any label, even the proudest. I don't think, however, that this reflects differences between ourselves and those who came before, or those who will follow after. It is, if anything, one of our most profound commonalities. If the essential core of Quakerism came *from* the early Quakers, then they were, by definition, exemplars of their kind, and all others since are necessarily less so. If, however, the essence of Quakerism came *through* the early Quakers, then the truest of their kind may walk among us today, or be yet to come. 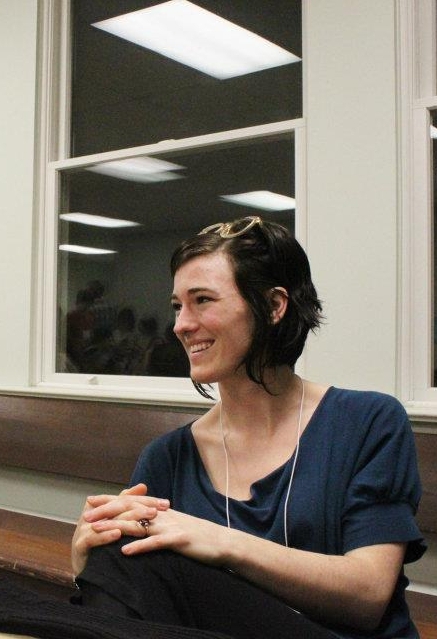 Chic Moran, a member of the Charlottesville, VA Meeting, once said to me during a conversation, "I don't know if I can call myself a Christin or a Quaker, but they are my possibility." I agree with him. At times I get "fed-up" with Quakerism thinking that we rely too much on past history and ask - "What are we doing today that future generation will think of?" I have also wondered if all of the Early Friends were "on fire" because we only hear about a few of them. I'd love for us to get on fire like we thibk the Early Friends were. Yet we aren't there and I intend to remain because it is my possibility and I don't see another place for me to be working for the New Order. Thank you Micah, for showing me the beauty and truth in Maggie's words. I did not see this until I read your post. Your words about doing more to nurture our communities and our meetings spoke to me. Often I find myself more interested in my own spiritual growth, than in engaging with my Meeting. Thank you, and Maggie, for speaking to my soul on this manner. I am not a Quaker but I find your activities inspiring from over here in the UK. I suppose my biggest misgiving is the notion of the 'inner light' ... I believe that everything happens on the outside and that the light only manifests itself in human interaction... I use Hegel's declaration as my guide ... the living ethical world is spirit in its truth. My Testimony is that true Quakers like Fox, Barclay, etc. exist today. True Quakers that follow and live in the Light. True Quakers that know that the Holy Scriptures are inspired by God because they live in the same Life and Power that gave them forth.True Quakers exist, they maybe few... but they are here! And the Light of Christ within taught them the same doctrines Early Friends upheld, before they read them in any Quaker book, but later they did find them in the writings of Early Friends and in Holy Scripture. God Bless! I appreciated Maggie's sermon and it's highly rhetorical hortatory to a small degree, but since i've said similar things to other "Quakers" over the years, sometimes even for similar reasons, i felt it unfair to quibble. And i appreciate Micah's re-framing her words so they are more hearable by some.
. But my question is Who are you to judge? And do you know all the Quakers? I've travelled a lot among Friends (as well as read many many memorial minutes) and have found in every corner of the Friendly World veritable saints, emulable Friends whose fire burns as brightly as Fox and Nayler and Penn's, whose actions --for today-- are just as earth-shaking, life-saving (and less hubris) and obedient to God's call as Jesus or any of the first generation.
. Marshall Massey speaks my mind and i agree that about 10% of the Quakers in the world in every generation have been the truly admirable, note-worthy exemplars that merit being on pure oats' boxes.
. But Speak for yourself, John. If thee thinks thy meeting lacks Spirit and needs fire under their collective tushes to walk in the Light, telling them (those trying with all their hearts and those idling in contemplative comfort both) what failures they are will do little good. If thee has a concern, make it thine. If you want more love in the world, start loving. If you want more Spirit in the world (or just thy meeting), open up, get faithful and start channeling the Holy Spirit instead of one of those sappy pseudo-zeitgeists we hear from all the time. The RSoF is a do-it-yourself religion.
. Except in judgement (and especially its scroogey seasonal sister judgementalism): That is God's alone. So stop judging and getting walking in the Light. Be patterns, be examples, in all places wheresoever you go, that your lives may preach... and they will bless the Light in you. Occupying the Fruit - or the Roots?